Hookafina stands out from other hookah e-liquid brands through a combination of quality ingredients and a wide variety of flavors. Hookafina put in over 10 years in the traditional hookah space before starting their line of premium e-liquid. Now they are a household name among hookah enthusiasts all over the world! Join the fun and spread the word of this high quality, U.S.-made e-liquid by browsing the selection at SouthSmoke.com. Your next favorite flavor could be right here with Hookafina! Inside each 15ml bottle of Hookafina e liquid is the refreshing taste of high quality hookah. Hookafina specializes in both the standard hookah flavors you come to expect as well as some of their own unique mixtures. Choose from the always-reliable Butterscotch, Pineapple, Double Apple, Blueberry, Pink Grapefruit, or go wild with Bahama Mama, Cantaloupe Mint, Irish Cream, Mimosa, Root Beer Float, and Strawberry Margarita. Hookah lovers of all tastes will find something to like from the Hookafina selection at SouthSmoke.com! Hookafina e-liquid has all the flavor that the Hookafina Blak line of genuine Hookafina Tobacco has, but you don't need to spend time setting up your hookah to get it. Hookafina e-liquid goes into your preferred e-hookah, so you can bring the flavor and fun wherever you go. No need to spend time setting up coals or managing heat - with Hookafina e-liquid, smoking hookah is instant, easy, and always a good time! Like our other e-liquid, Hookafina e-liquid emits vapor instead of smoke and is 100% tobacco-free, nicotine-free, and tar-free. Some would say this gets you a cleaner, smoother smoke that isn't as harsh as regular hookah when it hits your throat. We urge you to try Hookafina's e-liquid and taste the difference for yourself! It's said that Hookafina means "hookah with us." Won't you "hookah with us" by trying the premium Hookafina e liquid available at SouthSmoke.com? 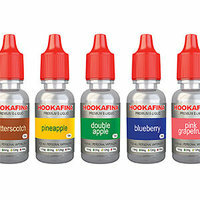 We offer a wide selection of Hookafina flavors that you can refill at your convenience into your preferred e-hookah. Available to you at an affordable price, the selection of Hookafina at SouthSmoke.com is made with your needs in mind. Buy individually to satisfy a specific craving or go wholesale and stock your smoke shop up with the full array of Hookafina flavors. Questions? We're available at 888-577-6653 or you can contact us online for any help you need.